IncomeActivator.com Makes It Easy For You To Create Your Own Online Income. Even Google is sending Shiner, a young Bull Terrier, checks when visitors click on ads on WhoLetTheDogIn.com. Shiner sells his own Ebooks, Clothing Line, and Unique Products, where payments and shipping are handled and he gets a check. He also sends leads to companies using Income Activator's Referral program. 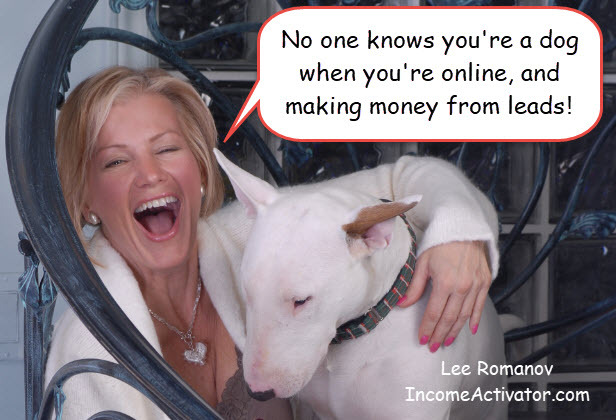 Entrepreneur Lee Romanov, who made her fortune online and sold her business, InsuranceHotline.com to Torstar, has created IncomeActivator.com, the first website builder that allows anyone that can type, to activate multiple revenue streams, referral programs and are guided through by Internet marketing strategies. Romanov says; "I wanted to prove that when you combine 'Technology' with 'Knowledge' even a dog can earn an income online. I'm hoping Shiner's online success shows people, if he can do it, they can too. Others with online business could also learn a trick or two from Shiner."